Spring is in the air. The bees are buzzing, the pollen is falling, and the flowers are blooming. It’s a beautiful time of year, but there are some blooming plants among us that despite their attractiveness don’t belong. Cogongrass is extremely aggressive and highly flammable. Invasive exotic plants are by definition plants whose origins are outside the United States and that once established alter how our natural ecosystems function. Oftentimes they reproduce and grow more rapidly than our native plants and quickly overtake entire areas, reducing habitat for our wildlife. Arguably the worst invasive exotic plant in Marion County is cogongrass. 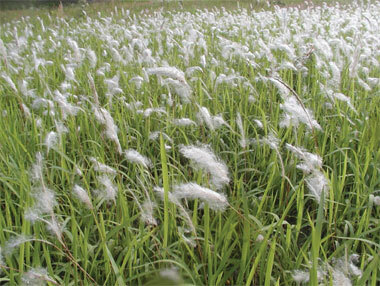 Its long white plumes are in full show right now along the roadsides and in medians. This tall lime-green grass has sharp leaf blades that can cut the skin if you rub your hand against it and is extremely flammable. Vehicles left running for too long in tall patches of cogongrass have been known to catch fire. Animals don’t eat it and before long the seeds and the long, sharp, underground runners can spread to completely consume entire forested areas, yards, and horse pastures. Another lovely invasive exotic plant blooming right now is chinaberry (pictured above). Chinaberry is small to medium sized tree and this time of year is covered with lovely purple flowers that emit a pleasant smell. The issue is, each of those flowers later produces orange berries that are toxic to people and mammals and can even paralyze birds. 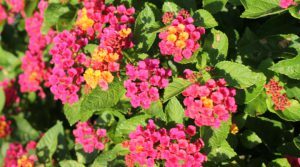 And lastly, one of the world’s worst invasive plants, lantana, is also showing off its brightly colored orange, pink, red and yellow flowers all around the county. Lantana camara is a popular butterfly plant not only for its attractiveness to pollinators but also for its hardiness. Unfortunately, the invasive exotic lantana has hybridized and replaced our native Lantana depressa which is now endangered. In fact, one invasive lantana plant can produce about 12,000 berries per plant, berries that are easily spread by wildlife regardless if it’s grown in a pot or the ground. And as if that wasn’t enough, all parts of the plant are highly toxic to livestock and people, including children who have been poisoned by eating the fruits. Thankfully, there are now two sterile varieties available to homeowners called Bloomify™Red and Bloomify™Rose. Either can satisfy our desire for beautiful lantana without wreaking havoc on our natural areas. If you have one of these invasive exotic plants on your property it is recommended that you remove it. Replace it with a native or Florida-Friendly non-native plant before it becomes too large or produces seeds. For more information about invasive exotic plants in Florida, call your Marion County Extension Service or go online to the UF/IFAS Assessment website: https://assessment.ifas.ufl.edu/. Amanda is the Florida-Friendly Landscaping Agent for the UF/IFAS Extension Service Marion County. She is proud to be serving the residents of her home county with their landscaping needs.